We're deep into summer now, baby. 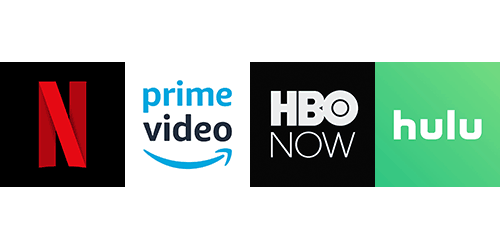 August is here, and with it come a whole bunch of changes to the catalogs offered by your favorite streaming services. Below, we've brought together all of our coverage of the changes coming to Netflix, Amazon, HBO, Hulu, and Crackle. We'll tell you what's coming, what's going, and what's actually worth watching this month. , arriving on the 11th, is the highlight here. Other new arrivals include gloomy comic-book movies Batman Begins (good) and Constantine (okay), plus a couple of solid Clint Eastwood flicks in Million Dollar Baby and Gran Torino. Click the link below for the complete list. Amazon's incoming class isn't its most impressive, but the classic cowboy flick High Noon is excellent and, if you ask me, the autobiographical Howard Stern movie Private Parts is low-key kind of good, too. The real treat comes in the waning days of the month, when mother! hits the platform. It's a real solid month for HBO: The Blind Side, Fargo, The Fugitive, Three Billboards Outside of Ebbing, Missouri, and Darkest Hour are all showing up. But save some time for dumb movies, too, because Super Troopers is hitting the platform and you only have a month left to watch the Final Destination and Tremors movies. is on Hulu, too, as is Private Parts. There's not a ton else here until late in the month, when Gangs of New York and mother! arrive, followed by The Terminator on the last day of August. mother! is so good, you guys, you have to watch it. Brokeback Mountain, Clue, and Trainspotting are leaving Hulu this month. Dumb-but-fun comedy Talladega Nights: the Legend of Ricky Bobby is here. For one month only, the platform will also have Anaconda, Black Snake Moan, Hot Fuzz, Shaun of the Dead, and Snakes on a Plane. What's with all the snakes, Crackle?